Three weeks after the category four Hurricane Maria struck Puerto Rico on 20 September, devastating the US Island, knocking out power and killing an as yet undetermined number of residents, local museums are back to work and helping with community relief efforts. The Museo de Arte de Ponce—home to the British artist Frederic Leighton’s masterpiece, Flaming June (1895)—on the hard-hit southern coast of Puerto Rico, reopened to the public on 28 September and is providing free admission through 9 October, the Columbus Day holiday. “We thought we could give people a little haven of normality,” says the museum’s curator Pablo Perez d’Ors, who reached the Art Newspaper by landline. (There is still no mobile service in the southern region.) Attendance has been strong, and museum’s director Alejandra Peña Gutierrez says people have come up to museum staff on the street to tell them “you’re doing a great thing for our community”. Museum staff are so popular that some have even managed to get ahead on the gas lines, Gutierrez says. The museum is helping its staff by providing shower facilities and allowing them to store food in the museum’s freezer and refrigerator, since they are still without power. Gutierrez says that the museum’s collections—including Frederic Leighton's Flaming June, arguably the island’s most famous work of art—are in “perfect shape” and that the building has no leaks, although staff needed to make the museum accessible to the public by clearing trees and leaves from the museum's surroundings. Staff were able to get to the museum the day after the hurricane to assess the situation—but had to leave written notes for each other on the front door, since there was no reliable means of communication. The museum had taken down a few works as a precautionary measure, and its diesel generator also kicked in even before the hurricane hit due to high winds, she says, noting that the museum has a protocol in place for tropical storms and hurricanes. The museum is currently showing a loan exhibition organised by d’Ors, centred on Flaming June called Frederic Leighton and the Eternal Mediterranean (until 15 January 2018), which includes 18 works lent by the Leighton House Museum in London. All of the loans are “completely fine and unharmed”, the London museum confirmed to The Art Newspaper. The Frick Collection in New York, a partner institution which borrowed Flaming June for a travelling exhibition last year, reached out to the Ponce Museum last week to confirm it will carry on with its scheduled loan of works to the institution for the exhibition Small Treasures from the Frick Collection. The show is due to open at the Ponce Museum in November as planned prior to Maria (until spring 2018). Puerto Rico’s museums had already been through Hurricane Irma, which struck the island two weeks before Maria, on 6 September. 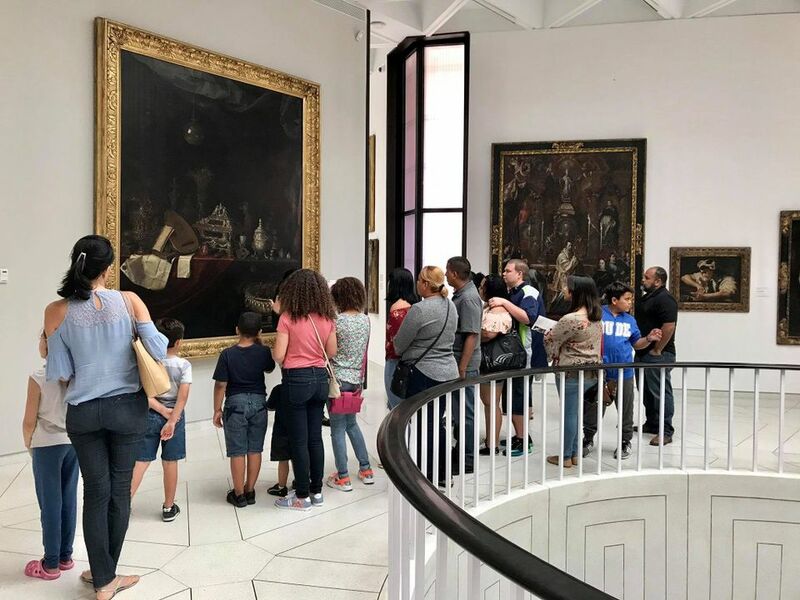 Lisa Ortega, the museum educator at the Museo de Historia, Antropología y Arte at the University of Puerto Rico in San Juan, told The Art Newspaper in an email that the museum had already closed for a week in September following Irma. “When we returned ‘to normal’, it was to prepare yet again [for a hurricane],” Ortega wrote. “We took all the precautions to protect the patrimony and equipment.” The museum’s building “suffered very little damage” during Maria, she said. The collection has not been harmed, and all of the staff are safe. The museum has mapped out a volunteer schedule for the week on its Facebook page, asking for members of the university community to help with cleanup efforts, such as clearing pathways. The Museo de Arte Contemporáneo de Puerto Rico (MACPR) in San Juan is serving the community through its programming, including free workshops, music and dance performances. “Today more than ever we are sure that art and culture will be important tools that will help our people cope and recover from this crisis,” the museum wrote in a Facebook post on 30 September. It is also helping in material ways, collecting water, food, medicine and other necessities in its main hall, which it will distribute to people in need. The San Juan-based Instituto de Cultura Puertorriqueña—whose staff were ordered back to work on 26 September by the government—has launched an initiative for local artists to volunteer their time to run cultural programmes for those affected by the hurricane (“Culture is resilience” and “Culture is happiness”, it says on its Facebook posts), and so far has had over 50 artists sign up. The Museo de Arte de Puerto Rico (MAPR) in San Juan remains closed, but staff are in the office working every day, says the interim director Marta Mavel Perez, who spoke with The Art Newspaper on a staff member’s mobile phone, since the landlines remain down. The museum has not suffered any major damage, nor have its collections, which are being kept in good condition since the museum has a diesel generator, although “we are trying to get [more] diesel”, she says. (Not all museums have such a generator, she notes.) But MAPR has decided to remain closed due to conditions such as the nightly blackouts—only five percent of the island currently has electricity—and communication issues, with no reopening date set. “As soon as everything comes back, we will be here for our public,” she says. In the meantime, the museum is functioning as a hub for a communication network between cultural institutions within Puerto Rico, working with other cultural institutions such as the Instituto de Cultura Puertorriqueña. Perez and the museum’s registrar have been visiting other institutions to help them examine their collections. Fortunately, they have not seen any major damage, she says. This article was updated on 5 October to include information from the Ponce Museum.